Moscow will host a one-day Blockchain and Bitcoin Conference on November 10 to discuss blockchain application in various segments of business and administration. The capital of Russia will play host to the Blockchain and Bitcoin Conference dedicated to the country. Covering topics of Bitcoin and cryptocurrency in general, as well as blockchain application in business and banking, the Moscow conference taking place on November 10 could result in some interesting conclusions. Bitcoin and blockchains may have started their lives as an obscure concept limited to a relatively small group of people, but as time progressed, the interest of general public has continued to grow. Today, cryptocurrency is a hot topic that catches attention of private users and big companies alike, in Russia and around the globe. The Blockchain and Bitcoin Conference, organized by Smile-Expo Company, will look to answer some of the common and not so common questions about potential application of the blockchain, the backbone of Bitcoin, in various business segments like payment systems, insurance, and assets management. 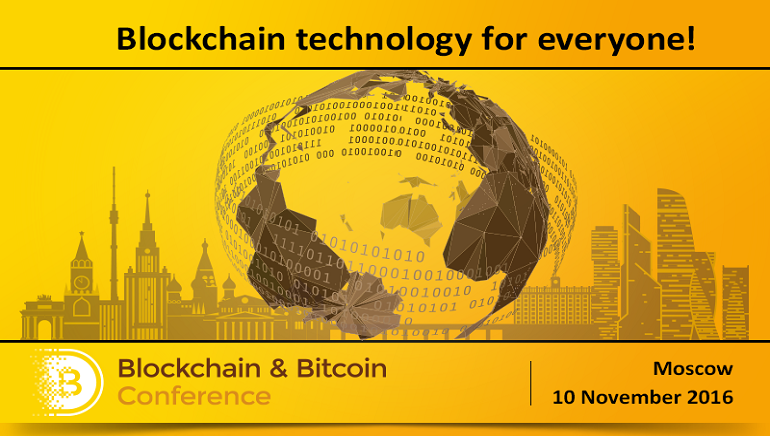 The one day conference on November 10 2016 is open to everyone interested in hearing more about Bitcoin and potential future applications. Some of the specific topics that will be covered during the conference include the types of businesses that blockchain can be used in, finding investment-worthy projects from this area, as well as foreign experiences and legislative issues. The Conference will gather investors, entrepreneurs, lawyers, and many other experts to share their experiences and ideas. According to Pavel Likhomanov, the event coordinator, some of the largest companies and payment systems from around the world have already confirmed their attendance, ensuring high quality program and great networking opportunities. Bitcoin and blockchain are no longer something that interests just IT professionals. The idea of cryptocurrency has taken its rightful place on the global financial market and more and more business and organizations are looking to expand their scope by looking into opportunities offered by Bitcoin. The Blockchain and Bitcoin Conference in November will represent a great opportunities for representatives of these business and organizations to get together and discuss the future of Bitcoin in Russia, with valuable foreign insights into the matter. Would you like to learn more? Visit the following link for more details and information: moscow.bc.events.